British India: Palace and Fort at Agra. 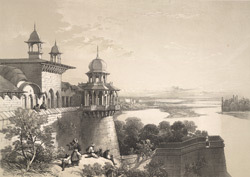 bl.uk > Online Gallery Home	> Online exhibitions	> Asia, Pacific and Africa Collections	> British India: Palace and Fort at Agra. Plate 5 from "Recollections of India. Part 1. British India and the Punjab" by James Duffield Harding (1797-1863) after Charles Stewart Hardinge (1822-1894), the eldest son of the first Viscount Hardinge, the Governor General. This represents the view as seen from the Palace and Fort of Agra. A major part of the Royal Fort was constructed around 1566 by the Moghul Emperor Akbar the Great, on the remains of an old mud fort, dating back to 10th century. Every succeeding Moghul Emperor, as well as the Sikhs and the British, added a pavilion, palace or wall to the fort. Emperor Jehangir extended the gardens and constructed the palaces in Jehangir's Quadrangle, while Shah Jehan added Diwan-e-Khas, Moti Masjid and his Sleeping Chambers. Aurangzeb built the impressive main gate. The famous Sheesh Mahal (the mirror palace) is in the northwest corner of the Fort.